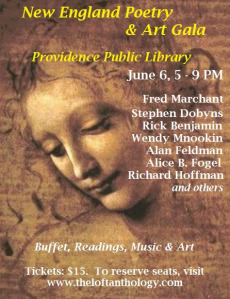 Please join us for a special evening of Poetry, Paintings & Music, on Thursday, June 6, at 5:00 PM – 9:00 PM in the Library’s newly renovated Grand Hall and Ship Room. Meet and be inspired by the poetry of Fred Marchant, Stephen Dobyns, Rick Benjamin, Wendy Mnookin, Richard Hoffman, Alan Feldman, Alice B. Fogel, Jennifer Militello, Vivian Shipley, and others! A buffet and refreshments will be served. Doors open at 5 PM for registration, appetizers and art exhibits. Featuring Guest Poets from throughout New England, the Gala celebrates the contributors of The Loft Anthology: New England Poetry and Art. Winners of the 2013 Loft Prize for Poetry, judged by nationally acclaimed poet Denise Duhamel, will be announced live at the Gala. Tickets: $15 by June 1. To reserve seats, please send a check with names and emails of attendees to: The Poetry Loft, PO Box 8235, Cranston, RI 02920. A confirmation will be sent to you with program details and additional information.